Innovation: A very few people in the whole world are aware that that there is so much of junk submerged in the oceans that an area equivalent to two France’s land would be insufficient to store. The plastic leads in the garbage in quantity for the all the material found there. Singapore’s design Studio Spark has picked the theme to depict the marine pollution’s reality. The people should realize and not litter the oceans. The Studio urges all to do something. 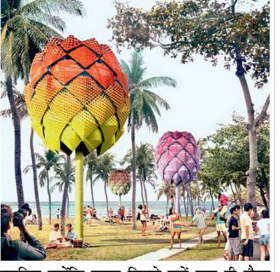 They have designed and created beautiful huts in the shape of palm trees from the garbage out of the oceans on the East Coast Park. The studio has arranged solar panels that the Park is lit up after the sunset. These huts are different from traditional shelters. They have an excellent and attractive combination of colors used to construct these huts. The stairs have a separate entry to go up on the Palm tree like structure. It was necessary that the buildings have the look of palm trees, as the park is on the seacoast. The cabins are lined up on the whole length of the seashore and have multi-coloured lights giving a very attractive decorative look. It is quite a picnic spot. 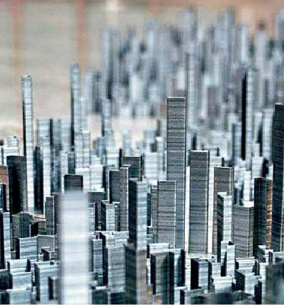 Creativity: Istanbul’s Artist Peter Root has used one hundred thousand staple pins and created ‘Staple City’ with a size of 600 cms x 300 cms model. He has given it a look of Manhattan. It took him forty hours to get ready the model. The time got extended because the staple stacks kept breaking and he had to get rejoined them. His work of art is available from all the prestigious magazines and social media websites. Recently, Reddit user, Robert Shez uploaded the picture and got 3245 trending points. Before this Peter has done projects in Science and Digital techniques.